We had a Great Barrier Reef diving and sailing adventure in the Whitsunday Islands on a three day and three night cruise aboard the custom built 18 metre catamaran Pacific Star. We cruised to Nari Inlet on Hook Island, bushwalked and saw aboriginal art, visited beautiful Whitehaven Beach on Whitsunday Island, cruised to Bait Reef on the outer Barrier Reef for a day of diving and snorkelling, and again at Blue Pearl Bay and Longford Reef. Pacific Star sails from Able Point Marina each Wednesday and Saturday evening. 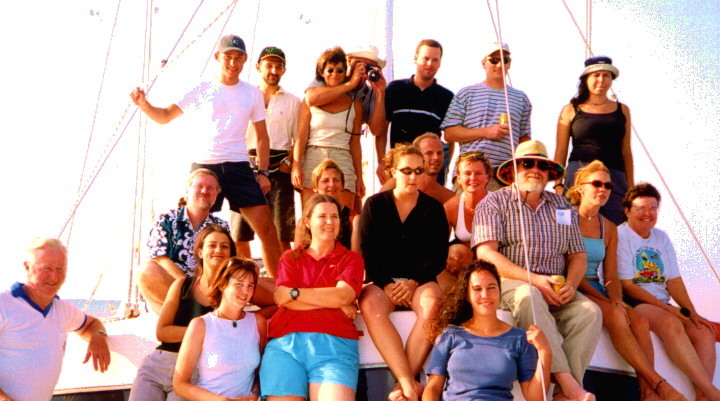 Passengers meet at the Kelly Dive and Sail shop on The Esplanade, central Airlie Beach. The night sailing does give more time for activities, however as breakfast is the first meal on-board, remember to have dinner before departing. We enjoyed tasty meals aboard, as well as snacks. There is a complete, but compact, galley aboard. Unlike many of the cruises, Pacific Star does not use premade meals from the local catering services. We enjoyed a wonderful variety of food for the three lunches and two dinners. 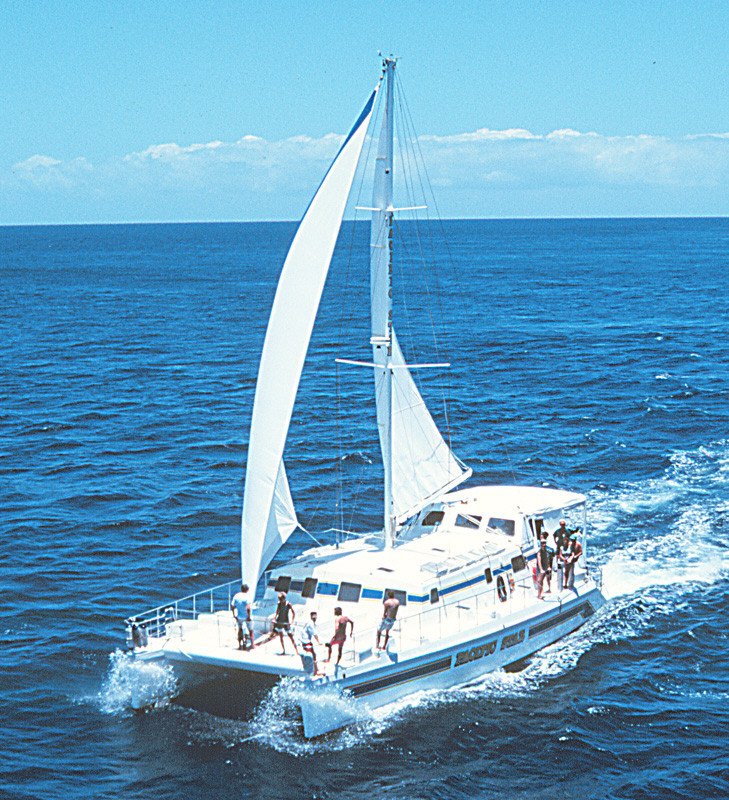 An 18 metre purpose built fibreglass catamaran, designed for diving cruises. Pacific Star has seven cabins, individual air-conditioners, and compact ensuite facilities. 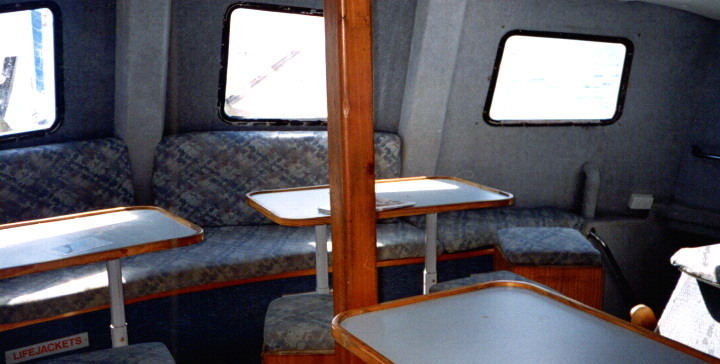 The large main cabin is air-conditioned, with TV, video, and CD player. There is a 35 kW generator set to run all the electrical gear, although when temperatures are pleasant they try to avoid running the generator overnight. Divers are well catered for, with two compressors on board, ample rack space for tanks, and hanging space for wet suits, plus room to suit up. There are two sets of steps to sea level platforms, with three steps below water level. No need to leap overboard, and no problems reboarding afterwards. There were sufficient wet suits in sizes 3 to 7 for everyone diving, although snorkellers sometimes had to use a wet suit that wasn't as good a fit. There were plenty of masks, snorkels and flippers (fins), mostly of recent vintage. No-one seemed to have any problem finding a suitable size. including all meals, but not drinks and government charges. Different prices are sometimes available as prices do vary from season to season. 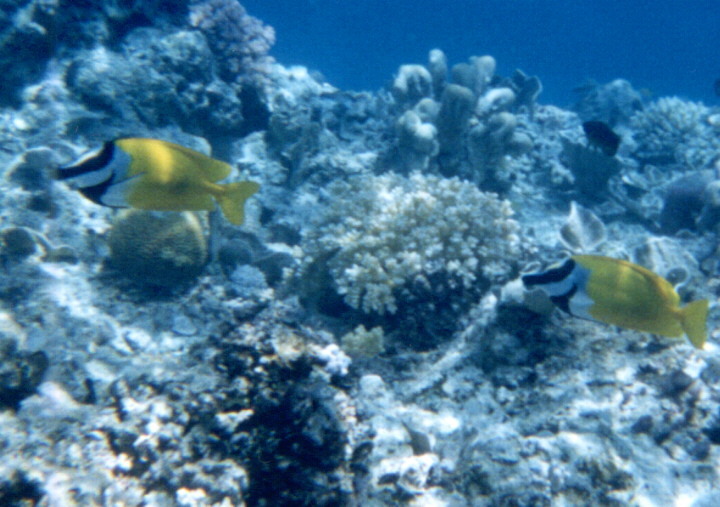 Government charges are a $4 per day Environmental Management Charge (Reef Tax) levied on all visitors to the Great Barrier Reef Marine Park. This $12 charge is collected on board. They are not included in the quoted fees. Diving is extra, with various packets available. 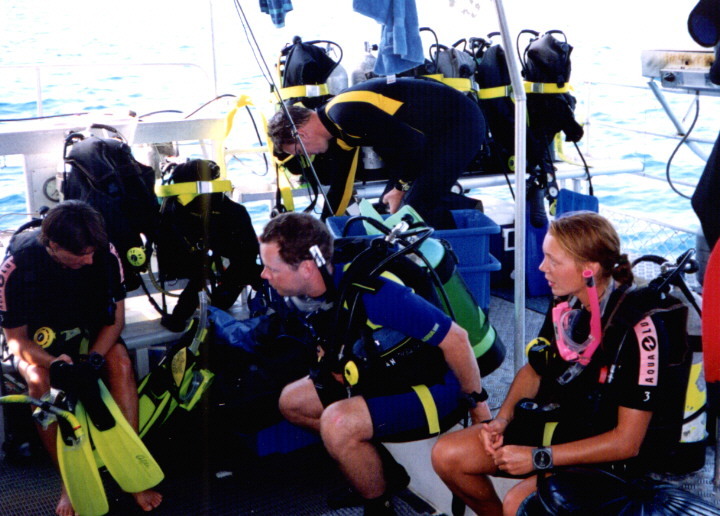 Certified divers can have 6 dives for A$160, and beginners can take two resort dives for A$90. Various other dive options are available. Prices include a courtesy coach from the Kelly Dive shop and return to your accommodation. All meals are included, as is afternoon tea, and snacks. You can buy candy and canned soft drinks on board, or bring your own. Since Pacific Star has no bar on board you bring your own alcohol, but not in glass bottles (for safety). 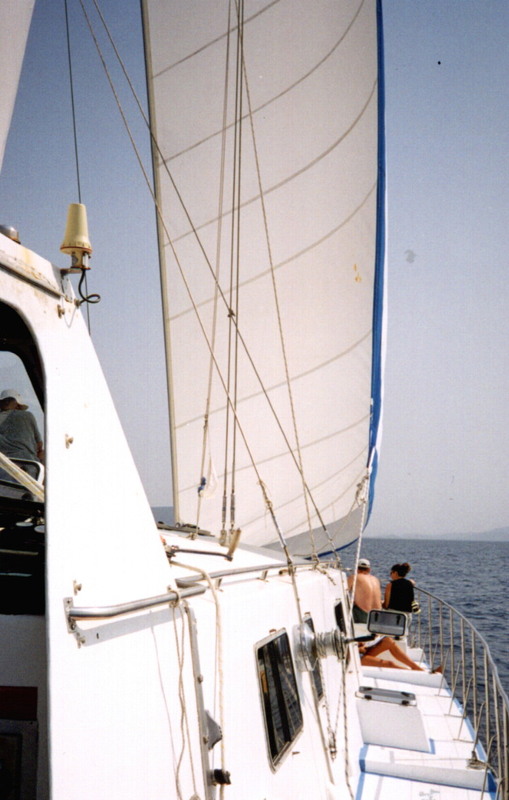 We each packed a small, soft sided bag, making sure we had swimming costume, towel, sunglasses, a hat that wouldn't blow overboard, and lots of sunblock. 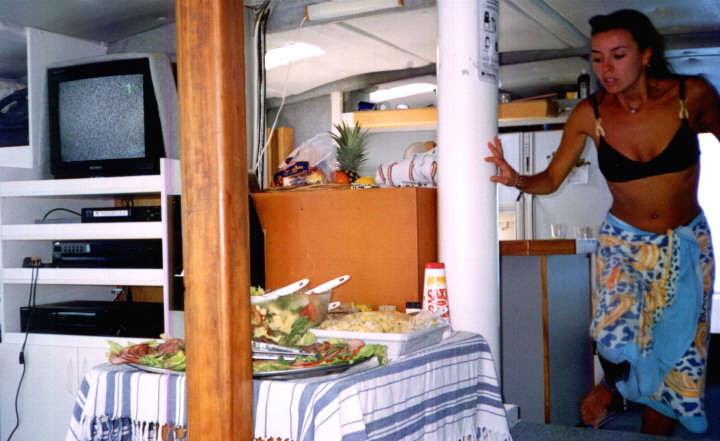 You go barefoot on board, and dressing up for dinner isn't expected, so shorts and a few shirts are enough clothes. Phone (07) 4946 6122 or fax (07) 4946 4368 or from outside Australia, phone + 61 7 4946 6122 or fax + 61 7 4946 4368 (where + is whatever you use to get an international line. 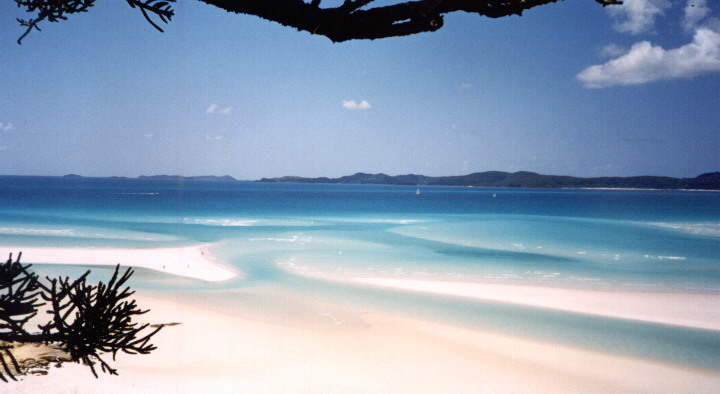 Check my Airlie Beach web page. First photo of Pacific Star courtesy of Kelly Sail and Dive, all other photos by Eric Lindsay and Jean Weber.